Do I Really Need a Professional for Smart Home Setup? | Anderson Electric Corp. Yes. Yes you do. That may seem terse, but the fact of the matter is that while you can set up your own internet of things in your home, having a professional do it for you offers enough benefits as to make it a better option. Not convinced yet? That’s okay. Take a look at the more specific reasons below that your smart home would be better off being set up by a professional. A smart home is usually not one or two smart appliances, but a network of different systems all communicating and working with each other. Maybe your door lock is connected to your phone, along with your water heater and your lights. 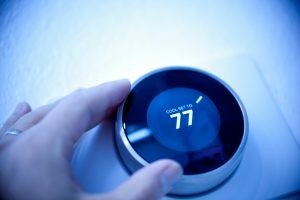 Maybe your air conditioner is set to a certain temperature every time you open the front door, so you can come home and enjoy a more comfortable climate at certain times of year. Installing one of these appliances may or may not be something you can do on your own (we don’t recommend messing with your climate control or water heater wiring yourself, for myriad reasons). Installing all of these appliances so they can work together properly, though, is something that only a professional has enough expertise to do consistently. Some smart appliances carry virtually no risk of doing anything unsafe, even when not operated properly. Plenty of others can make you vulnerable in ways you haven’t thought of, though. For example, setting up your lights with some form of automation might only carry a risk of turning them on accidentally at weird times. A bit of extra cost on the electric bill, but no big deal beyond that, right? What about your doors and locks, though? What happens if your door unlocks while you’re out, or on vacation, and you don’t realize it? You can see how some of these things can be very disconcerting indeed. A professional technician, though, knows how to install and set up everything so that there’s minimal chance of that kind of thing happening. They also know how to show you how to operate each and every element of your smart home, so you are less likely to accidentally open yourself up to those kinds of things. Anyone who has ever had to assemble or install an appliance knows that it can be an absolute nightmare the first time around. Some smart home appliances and systems are “plug and play” but most of them aren’t. You’re going to need some level of installation and configuration time before you can start making use of them. If you hire a professional to take care of it for you, though, you can be sure that they’ve already done this a number of times before. They’ll be able to get everything up and running faster, which means you won’t have to struggle through hours of instruction manuals yourself. Anderson Electric Corp. offers full smart home setup services. Contact us today to schedule an appointment with an electrician in Bloomfield, NJ.